Our most generous supporters are critical partners in our work. Donating a major gift makes a huge difference to the lives of thousands of cats and dogs in the UK and overseas - every single year. Supporters like you are vital to our success; we are entirely reliant on voluntary donations to keep our doors open. Our unique approach has always been to combat animal welfare problems at the source by undertaking proactive, preventative work in our communities, aiming to reduce the numbers of pets entering shelters. We also demonstrate the health and well-being benefits that pet ownership and interaction with animals can bring. At the core of our values is compassion for people and for animals. We provide all major donor with regular updates, which enables you to see the impact of your donation. 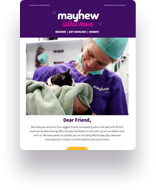 You can be confident that by investing in Mayhew, you are investing in the future of animal welfare. A tailor-made experience according to your passions and interests. For example, a behind the scenes tour of our Home or a visit to one of our community outreach projects. We will provide you with exclusive event information. At our events you can find out more about our projects and meet influential guests, like you, who are making a real difference to the world of animal welfare. We welcome all feedback from our donors and will listen to what you have to say. We will take action whenever and wherever appropriate. There are many opportunities for you to work with us in areas that are of interest to you. From our work with the homeless to education in the local community, find out more about our projects. We provide free and low-cost care for all pet owners and our in-house animals. Find out more about our clinic. We help unwanted dogs, puppies, cats and kittens that are looking for their forever home. Find out more about our rehoming work. Working with local communities in Afghanistan, Georgia, India and Russia. Find out more about our International projects. "I have been a donor for many years and have been very pleased to be able to support the work for Mayhew in the local community. This is a very disadvantaged area in many ways and the Animal Welfare Officers and teams in the kennels and cattery, TheraPaws and the veterinary clinic provide a tremendously valuable resource to improve the welfare of animals and their owners, many of whom are in challenging circumstances. Their work in Afghanistan providing a rabies vaccination programme has also been outstanding. I very much value the work of Mayhew and their principles of enhancing animal welfare. We have had a number of Mayhew cats and still have Thomas, our lovely ginger cat." Would you like to donate £500 or more? We can help. Contact us to find out more about our programmes and how your donation could help. You could become a voice for the voiceless and help to end the suffering of companion animals. Our Trust and Major Donor Officer is on hand to tell you all about the work we do at Mayhew. Please get in touch with us for further information.